A little piece of trivia – rhubarb is actually a vegetable. However, in the kitchen it is usually prepared as a fruit, and because of it’s tart flavor, rhubarb is often cooked with sugar and used in pies or other desserts. Growing up in the Midwest, rhubarb (being a perennial), seemed to grow everywhere. We’d snap off a piece and enjoy the raw, tart, crisp stalks alone or dipped in a little sugar! Of course, there’s countless versions of recipes for rhubarb crisp, rhubarb and apple crumble, and my mom’s absolutely delicious recipe for rhubarb crunch (pictured below) that we enjoyed during those summer months! I just love these handwritten recipes – especially the ones from my mom!! Recently, I was trying to find a “lower sugar” version of a rhubarb recipe, and everything I found just seemed a bit disappointing (in my opinion) – not something I’d feel proud serving for company, which is kind of a litmus test for me. So I decided to do a little experimenting and came up with the following recipe. Since I typically don’t enjoy food substitutions or versions of dessert recipes that are tweaked to be “healthy” (they leave me a bit dissatisfied which is not the point of dessert), I was pleasantly surprised with how this turned out. In some recipes, ingredients like sugar (or even salt) actually overpower the flavor of the food it’s added to. In fact, we’ve become a bit “used to” this level of sweetness or seasoning – and have come to expect it. As I’ve said before, we don’t need to “cut sugar out” of the diet, but we do need to recognize when we are missing out on the natural flavor of food because it’s masked or covered up by these highly palatable ingredients. Therefore, preparing this recipe with less sugar seemingly highlights the deliciousness of the unique, tart flavor of the rhubarb and it doesn’t seem like a compromise on flavor. And…the crunch and light sweetness of the topping was accented with the addition of the walnuts. Absolutely delicious! So, it passed my litmus test and I would definitely serve this for my guests! Rhubarb is a nutritious addition to many recipes. Typically baked with a lot of sugar to balance its tartness, this rhubarb recipe has just the right amount of sweetness from the strawberries and honey, so it’s a delicious treat, but not too much so you can still enjoy the tang of the rhubarb! In another bowl, combine the dry ingredients. Mix in butter with fork until crumbly and spread over top of the fruit. Bake for 40 minutes, until rhubarb is tender and the topping is toasted. Note: if using frozen rhubarb, thaw according to package directions. Consider adding about 1 ½ tablespoons cornstarch to the rhubarb, honey and strawberry mixture. Categories: Recipes | Tags: low sugar dessert, Nutrition, Recipes, rhubarb | Permalink. It’s that time of year for pulling out those beloved family recipes. This is a family favorite, not only because of the seasonal deliciousness of pumpkin and spices, but because it’s quick and easy to prepare! All you need is a bowl, spoon and pans for baking – and having some kids around who can just pour and stir is a bonus. With holiday gatherings approaching, this recipe is a plus as it makes TWO loaves – so you can enjoy one and freeze the other. In a large bowl, stir together flour, sugar, baking soda, salt, cinnamon, nutmeg, cloves and baking powder. Add pumpkin, oil, eggs and nuts to the dry ingredients and stir until moistened and mixture is smooth. Bake 60 minutes or until toothpick inserted into center comes clean. Remove from pans and cool on wire racks. Wrap in plastic, then aluminum foil and store in refrigerator or may also be frozen for later use. 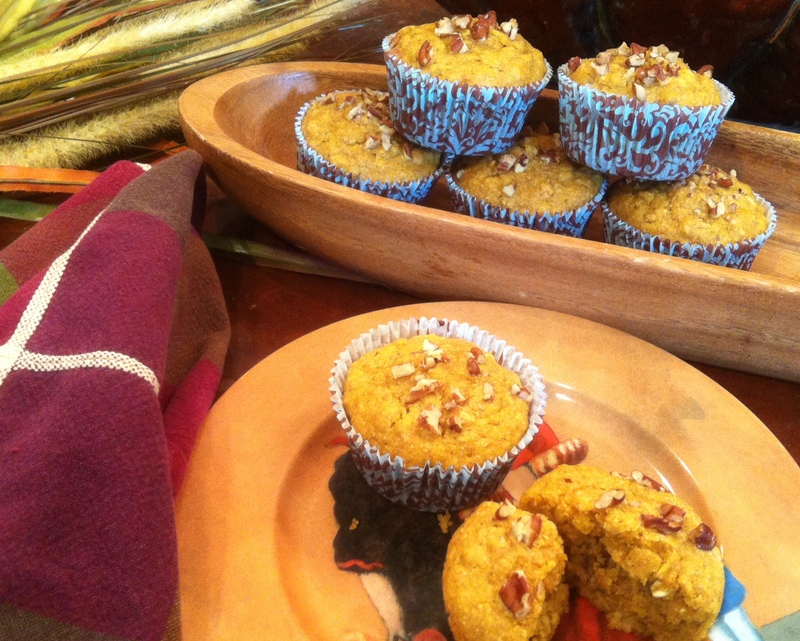 Categories: Recipes | Tags: Pumpkin, Pumpkin bread, Thanksgiving recipes | Permalink. I grew up with a small garden that my parents tended to every year. Each summer we had fresh veggies right out the back door – carrots, leafy greens, kohlrabi, potatoes, tomatoes and cucumbers. Looking back, I truly took it for granted. The food was fresh, flavorful and we ate all summer from our garden. Where I live now, unfortunately I do not have the space for a garden – but the real reason is that I’m a horrible gardener! I can hardly keep my summer flowers alive, let alone tend to a garden in a respectable way. But I miss so much those fresh, seasonal veggies. “Farmers get to spend time marketing the food early in the year before their 16 hour days in the field begin. They also have the unique opportunity to meet the people who eat the food they grow. I have to admit it has taken some adjustment. For example, I’m such a creature of habit and regularly do my meal planning and grocery shopping at the beginning of the week. So, it caught me off guard when food I hadn’t planned for was coming into the home mid-week (I pick up my share every Wednesday). We don’t find out what produce will be in our share until the night before so I’m practicing some spontaneity and flexibility with my meal planning and cooking habits. And, what a treat it has been! In one of my first boxes, we got kohlrabi. Yum! I don’t think I’ve had this vegetable since I lived at my home in Nebraska – so over 30+ years ago! Not quite sure why I haven’t bought this in the grocery store over the years, but when it’s ready to picked and harvested, that’s what you eat! So, now my meal planning is at the mercy of what the farmer harvests that week, which brings me to my CSA Summer Veggie Stir Fry. I recently received such a bounty of leafy greens, lovely beets and some gorgeous scallions. Right away I couldn’t wait to make the following recipe. I have to give credit for this stir fry to Nadia Giordana who demonstrated it on the talk show, “It’s a Woman’s World,” that I was a guest on earlier this week. Her veggies were a little different (based on what was fresh from her garden), but the idea is hers! A fresh, flavorful and nutritious recipe perfect with any of your favorite summer vegetables. Heat oil in a heavy skillet over medium-high heat. Add scallions and garlic and lightly saute (about 1-2 minutes). Add beans, beets, and other vegetables that require a longer cooking time, and stir fry approximately 3-4 minutes. Add leafy greens and cook another 1-2 minutes longer. Drizzle in sesame oil and soy sauce and stir until ingredients are combined. If desired, season lightly with salt and pepper – but taste first because it may not need it! Categories: Recipes | Tags: CSA farm, Eat Real Food, Vegetables | Permalink. There are many recipes for “green smoothies”. However, it seems they are either loaded with extra calories and sugar (to sweeten them up) or they taste like, well you know, something green. An added bonus for athletes is this recipe features Tart Cherry Juice concentrate, known for its anti-inflammatory and melatonin properties. * Note: Tart cherry juice is either available in a concentrate or 8 ounce “juice” serving. The juice is from a specific variety of sour cherries (prunus cerasus) and include the Montgomery or Morello Cherry. The tart cherry has received a lot of press over the past few years as a powerful anti-inflammatory and natural sleep aid. Categories: Recipes, Uncategorized | Tags: Green smoothie, protein, Recipes, sports nutrition | Permalink. The Thanksgiving Day feast is right around the corner! Just the thought of some of our favorite seasonal foods and heirloom recipes can make the mouth water. For some, the plan is to just throw caution to the wind and enjoy this ONE day of feasting. Not a bad idea. But, what about the next day? What about those leftovers? Whether your plan is to practice some moderate restraint or throw caution to the wind at holiday meals or events, many people struggle to get back on track with their usual diet the day after the big meal. Too often one day of indulgence seems to turn into a downward spiral of over-eating that culminates on January 2. My recommendation is to plan for the day after. What’s on your menu for the Friday after Thanksgiving or the big holiday party? Instead of diving into plates filled with leftovers of carb-laden goodness in the days that follow your holiday event, consider planning out your meals for the following week. Add plenty of wholesome fruits and veggies to your shopping list while being mindful of including a selection of some of your Thanksgiving day foods to your meals, such as adding leftover turkey to a colorful salad or paring leftover cranberry salad and green beans with grilled salmon. The recipe that follows is a wonderful example of a flavorful and nutritious salad that you can “look forward to” even after the big feast! This gorgeous salad is loaded with seasonal favorites – pomegranate seeds, pears and cranberries. Enjoy as a tasty side dish to any meal or add in some leftover Thanksgiving day turkey or roasted chicken for a great entree salad. Combine greens in large bowl with other main ingredients. In small bowl, combine vinegar, oil, sugar, salt and pepper. Whisk to blend. Drizzle over salad, toss to combine. Optional: add chopped chicken breast or leftover turkey for a wonderful entree salad. Categories: Recipes, Uncategorized | Tags: Holiday eating, Meal planning, Recipes, Thanksgiving | Permalink. 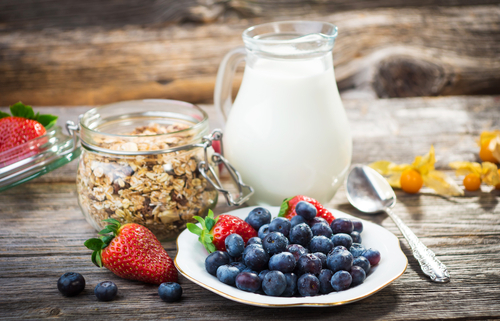 Plenty of research demonstrates that a healthy, balanced breakfast has many benefits (i.e. better weight management and increased focus and concentration are a couple). If you aren’t convinced, read “Reasons to Not Skip Breakfast”. Fruit and Yogurt Smoothie. Blend 1 cup plain Greek yogurt with 1 cup frozen fruit (banana and berries work very well) and 1/2 cup liquid (milk, juice, coconut water, etc.). Freeze overnight and thaw throughout the day to enjoy in the afternoon, or blend up in the morning. Peanut Butter Banana Smoothie. Blend 1 small frozen banana, 2 tablespoons peanut butter, 1 cup milk, and 1 cup crushed ice (option – add 1 scoop chocolate whey protein). CIB Smoothie. For an extra boost of calcium and protein, combine one packet of Carnation Instant Breakfast with 1 cup milk. Add 2 Tbsp. peanut butter and one small ripe banana. Blend with crushed ice. 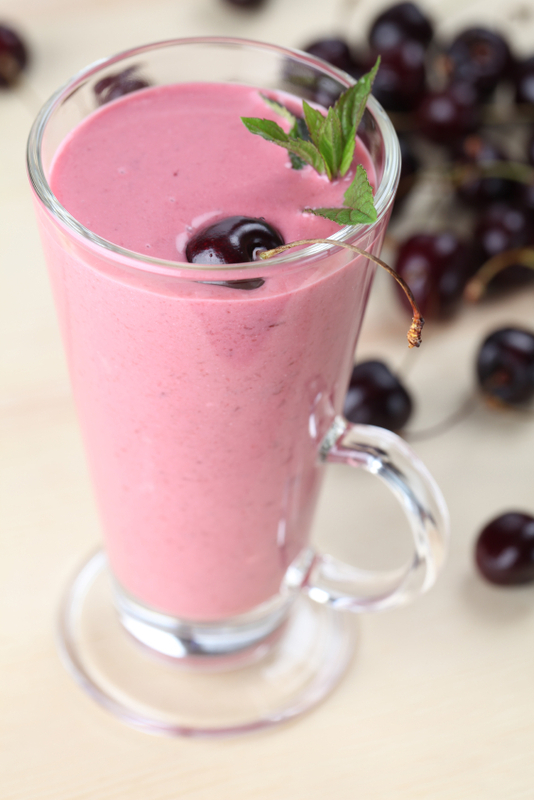 Tart CherryBerry and Kale Smoothie. Feeling sore and tired? Try adding this smoothie that uses Tart Cherry Juice, known for its benefits of fighting inflammation and aiding in sleep. Start by liquefying ½ cup 100% tart cherry juice blended with handful baby kale. Add 1 cup plain Greek yogurt and 1 cup frozen berries. This recipe uses Tart Cherry Juice available at a variety of health food stores, such as Trader Joes. Yogurt Parfait. This is one of the easiest breakfasts that provide a great balance of protein and carbohydrates for athletes on the go. Choose a variety of toppings, such as ¼ cup unsweetened granola, 1 tbsp chopped almonds and 1 cup frozen berries. Try choosing fruits that are in season, such as yummy, sweet berries in the summer, flavorful apples or a dollop of pumpkin puree come fall. Tropical Yogurt Parfait. Top vanilla or plain Greek yogurt with ½ cup crushed canned pineapple (drained) and ½ sliced banana. If using plain, unsweetened yogurt, you may want to drizzle with a couple teaspoons of honey and top with shredded raw coconut. Microwaved Scrambled Eggs With Veggies. Yes, it is possible to make really good eggs in the microwave. And it’s easy! Beat 2 eggs, throw in a microwave-safe container, add 1 handful of your favorite veggies (spinach leaves, mushrooms, onions, cherry tomatoes are a few ideas), and a sprinkle of cheese. Zap the mixture for 30 seconds, stir, and cook another 30 seconds, or until eggs are solid. Prep the night by storing the raw mixture in a fridge until ready to heat and eat in the morning. Breakfast Burrito.Breakfast burritos are full of good nutrition and easy to grab and go. Scramble 2 egg whites, 1/4 cup black beans, 2 tablespoons salsa, and 2 tablespoons shredded cheese, and wrap in 1 small whole-wheat tortilla. Make ahead by preparing a few at a time, wrap in foil, and keep in the freezer until ready to reheat. Super Special Scrambled eggs. This tasty breakfast is packed with good nutrition for the stressed athlete! Simply lightly sauté handful of spinach with 1 ounce smoked salmon. Toss in 1-2 beaten eggs with the spinach mixture and cook through. If desired, melt in ½ Tbsp. cream cheese and season lightly with salt and pepper. Serve on top of lightly toasted whole grain baguette – Yum!! Egg Sandwich. Who doesn’t love a classic egg sandwich? I remember my father-in-law adding a dollop of salsa to his! So use your creativity with this one. Simply prepare 1-2 eggs to your liking. Place between 2 whole-wheat English muffin halves (or toast) with 1 slice of cheddar cheese. Pile on some veggies or salsa, if you wish. Wrap in foil so the cheese melts evenly, and enjoy! Zucchini Muffins. Make a batch of your favorite zucchini bread or muffins to easily fit a serving of veggies into a delicious baked goods. Toss in some ground flax for a healthy dose of fiber and omega-3 fatty acids. Fruity Breakfast Quinoa. Simply prepare quinoa according to package directions, substituting milk for water. Add your favorite spices, such as cinnamon, nutmeg or pumpkin pie spice. Top with fresh berries and chopped almonds. Pumpkin Pie Oatmeal. Skip the pumpkin spice latte and enjoy a more wholesome autumn treat for breakfast. Simply prepare quick oats in the microwave according to package directions adding a heaping dollop of pumpkin puree, pumpkin pie spice and low-fat milk or almond milk. If desired, drizzle with a couple teaspoons of maple syrup or brown sugar and walnuts for a quick and easy breakfast before heading out the door. Overnight Oats.This popular Pinterest pin makes a lot of sense for anyone who really has no time for messing around in the kitchen in the morning. The night before, combine 1/2 cup milk, 1/3 cup rolled oats, 1/2 a mashed banana (or fruit of choice), 1/4 cup chopped nuts (or chia seeds), and a sprinkle of cinnamon in sealed Tupperware container or 1-cup mason jar. By morning, you’ll have delicious overnight oats! These can be heated in the microwave for 1-2 minutes if in the mood for something warm. Waffle PBJ-Wich. Try this sweet take on a classic breakfast sandwich the next time eating on the go. Prepare 2 whole-grain toaster waffles. Spread one half with 2 tablespoons nut butter and layer 2-3 sliced strawberries or ½ sliced banana on top in place of the traditional jelly. Top with other half. Apple-Wich.This is a perfect pick for apple season, Cut 1 apple in half and remove the core. Drop 2 tablespoons of your favorite nut butter between the two holes, and sprinkle in 1 tablespoon granola. Wrap up the whole apple in plastic wrap and pair with a portable serving of milk for an easy grab and go breakfast. In a large mixing bowl beat the brown sugar, oil and eggs together. Add in the oats and pumpkin. In a small bowl, combine the dry ingredients. Gently mix dry ingredients into oat mixture, mixing as little as possible. Fold in 1/3 cup nuts (if desired). Pour batter into paper lined muffin tins, filling each muffin cup approximately 2/3 full. Sprinkle tops of muffins with remaining chopped nuts (if desired). Bake about 12-15 minutes or until toothpick inserted into the center of a muffin comes out clean. Preheat oven to 350 degrees F. Line a muffin pan with liners and set aside. In a medium bowl, whisk together flour, baking powder, baking soda, salt, and cinnamon. Set aside. In a large bowl, peel the bananas and mash with a fork. Add brown sugar, oil, egg, yogurt, vanilla extract. Stir well until combined. Slowly stir in the dry ingredients. Mix until just combined. Fold in walnuts if desired. Fill muffin liners 3⁄4 full. If desired, sprinkle with cane sugar. Bake until toothpick inserted in center comes out clean, about 22 minutes. Transfer to wire rack to cool. Add the remaining ingredients the dry ingredients and mix until combined. Store in a covered container in refrigerator up to 6 weeks. If desired, fill ramekin or muffin cup (placed in microwaveable dish) with batter and microwave for 1 minute, checking every 30 seconds until cooked through. Categories: Recipes | Tags: breakfast, eggs, protein, sports nutrition | Permalink. This is one of my all time favorite summertime salads. I discovered it in the 2005 issue of Shape Magazine a while back and have modified it slightly by adding grilled chicken for a yummy entree salad. Enjoy! 1. Whisk the lemon or lime juice and honey in a large bowl. 2. Add spinach; toss lightly to coat. 3. Add watermelon, blueberries, cucumber, onion, and chicken; toss. 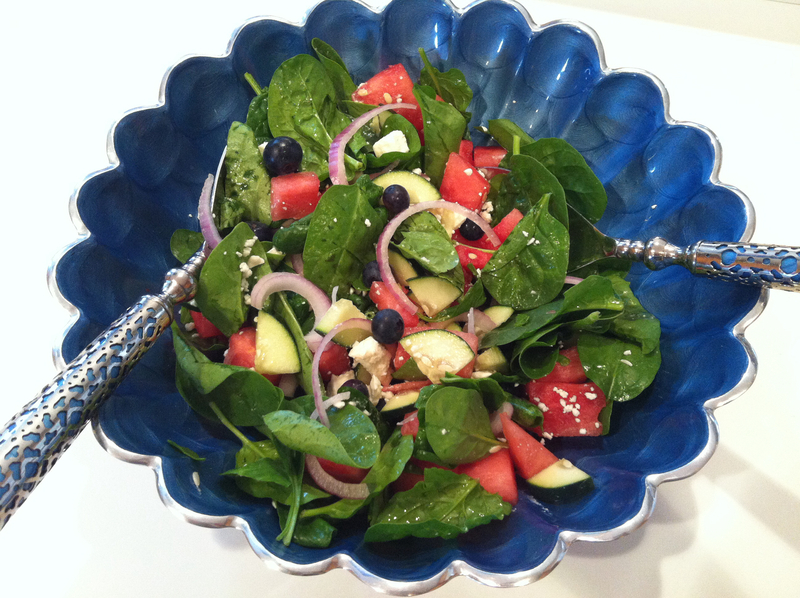 Categories: Recipes | Tags: salad, watermelon | Permalink.